Always Best Care combines national strength and standards with local accessibility and personal service. Danielle Loupee and her family, the owners of Always Best Care-Michiana, are local residents and take great pride in helping families care for their loved ones. Our goal is to join your family's journey and provide the absolute best care plan for your loved one. Our entire team has your loved ones best interests at heart, and we'll ensure that exceptional service and care is provided to all family members. All our caregivers are carefully screened, thoroughly trained, bonded and insured to provide the safest and highest level of care. We will continue to build strong relationships with area hospitals, social workers, senior communities and senior resources across our communities. We're here to serve your needs, and we can help. Are your staff that deliver in-home care in Michiana insured and bonded? Yes. Not only are our staff fully insured and bonded but also benefit from being covered by Worker's Compensation as well. All of these things work to protect your loved one against any damage, theft, or injury while they receive in-home care in Michiana. How are your staff that provide home care in Michiana vetted? Of course. We want you to feel completely at ease with the people responsible for providing your loved one's senior cane in Michiana, so we have a strict vetting process in place. Every person that applies for a caregiving role with Always Best Care has to pass a criminal background check and drug test so that we can feel confident that they're of the right character to perform the role with honesty and integrity. On top of this, we also ask each applicant to supply us with three references and have our recruitment team assess the candidate during two sit-down interviews. What hours do your staff provide in-home care in Michiana? You just let us know what hours you need us, and we'll be there to provide your loved one with the best senior care in Michiana. That's right, Always Best Care's services are available 24 hours a day, 365 days a year, so it doesn't matter if your loved one needs help getting dressed on Christmas morning, or whether they need someone to tuck them into bed on New Year's Eve, we'll be there. Will my loved one have the same caregiver to provide them home care in Michiana on every visit? Yes. We can't stress enough how important we feel trust is when it comes to elderly care in Michiana. Your loved one needs to feel like they can trust the person responsible for their care, as without it, the whole experience can be something they dread. That's one of the reasons we always make sure that the same caregiver is responsible for your loved one's care on a daily basis. By being able to spend time together, their relationship can grow from one of mutual respect to friendship. There will be odd occasions when your loved one's caregiver takes a vacation or comes down with the flu, but even then, we'll have a friendly substitute caregiver on hand that will be able to step into their shoes during their time away. How will my loved one be matched with their caregiver that's responsible for providing their in-home care in Michiana? This is the fun part. We try to match seniors to their caregivers on more than just location and physical requirements. Little tidbits of information, such as your senior's political interests, their hobbies, or even their pet peeves can help us to build up a profile of the type of caregiver that we feel they would match well with. We do all this to help make the first few weeks of a senior's in-home care in Michiana much more comfortable. Over time, we hope the things that the senior and the caregiver have in common can help them to build a long lasting relationship. How are your caregivers trained to provide senior care in Michiana? How to spot any visible or mental signs of illness, such as lumps and bumps or a desire not to leave the house. How to carry out a thorough risk assessment of a senior's home. How to communicate in a clear and patient manner at all times. Many of the staff we take on already have experience in the industry, so this training is largely designed to ensure that their standards of senior care in Michiana match up to ours. Once a year, our full-time caregivers are also asked to take part in top-up training, where they will be taught about any new technology, equipment, or legislation being brought into the industry. Why should I choose your home care in Michiana instead of an independent provider? Trust. It's understandable that a lot of families look at cost as the deciding factor of which provider of home care in Michiana to choose for their loved one. Scratch beneath the surface, however, and you'll quickly begin to realize that there are huge differences in the levels of assurances and – potentially- standards of care offered by Always Best Care and independent providers. For example, all of our caregivers are fully vetted, insured, bonded, trained, and continually monitored. In comparison, many independent providers only have training or experience to their name. When it comes to leaving your loved one on their own in someone else's care, you have to feel 100% sure that the person is someone you can trust. At Always Best Care, we have these assurances in place so that you already know the answer to your own question. How quickly can my loved one expect to begin receiving in-home care in Michiana? Arranging a fully-fledged care plan for your senior, including nutritional advice and a staff schedule for the month ahead. Matching your loved one to the most appropriate caregiver. Carrying out a safety assessment on your loved one's home and advising on any potential changes. What role do family members play in their loved one's elderly care in Michiana once a caregiver has been hired? Part of the reason we offer 24-hour senior care in Michiana is to allow families to choose a care plan that fits around their schedule. We want you to play as large a role in your loved one's life as possible, as we know how much your company can boost their mental health. If you're part of a family that doesn't live within a short distance of your loved one, we promise to do all that we can to make you feel like a part of our care team. That includes ringing you up on a regular basis to discuss your loved one's health and any other important details about their behavior. How do I know if Always Best Care is the right choice for in-home care in Michiana? If you're feeling a bit befuddled by all of the contrasting information available online about elderly care in Michiana, don't worry, we've all been there. We'd love for you to come and speak us directly for a chat so that we can discuss your loved one's needs and how we can help them. We'll run through all of the extra special touches about our care that you may have missed online, and you'll be free to ask any questions you might have at any point. Finally, it's worth reiterating that this chat is completely free and you're under no obligations whatsoever. If you decided Always Best Care isn't the right choice for you and your loved one, that's absolutely fine. 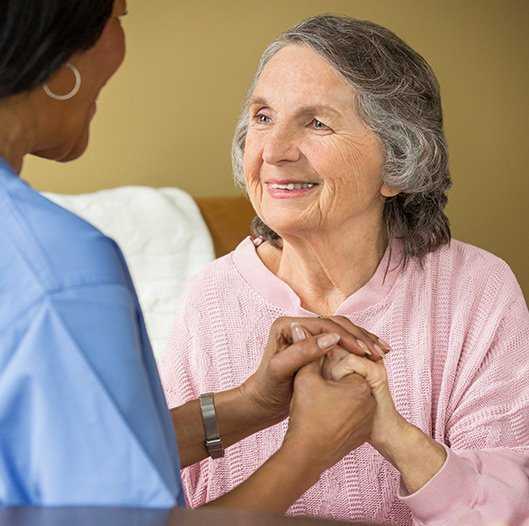 What steps are taken to ensure that my loved one's in-home care in Michiana is safe? All of your caregivers are trained to provide in-home care in Michiana with a safety first approach. We follow a three-step safety approach that helps to reduce the risk of your loved one suffering from an accident on our watch. Step one: training During training, our caregivers are taught to how to spot symptoms of illness and how to carry out a detailed risk assessment. Step two: risk assessment An experienced member of our team will carry out a risk assessment of your loved one's property before our caregiving services begin. They will list details of changes that can be made to make your loved one's home more senior-friendly. Step three: monitor Your loved one's caregiver will monitor them at all times, and will always provide them with mobility assistance should they need it. Do I need to sign a contract or agree to an hourly minimum for my loved one to be applicable for your home care in Michiana? No. Our in-home care in Michiana is intended for everyone, so you'll never have to agree to a minimum number of hours care per week or sign any long-term contracts. Do you provide in-home care in Michiana for individuals suffering from Alzheimer's or other forms of dementia? Yes. Many families that have a loved one that is living with dementia choose elderly care in Michiana over a residential or nursing home due to the risks involved in suddenly changing their living environment. As a result, we have a specifically trained team ready and waiting to provide your loved one with the patient and attentive care they deserve. They've been trained in how to respond to certain behavioral traits of the condition, so they'll be able to quickly calm your loved one in any times of distress. If I choose your in-home care in Michiana, what type of services can my loved one expect on a day-to-day basis? Do you provide respite in-home care in Michiana? Yes. Our respite care, which is designed for families that provide their own full-time senior care in Michiana for a loved one, has been growing in popularity on a yearly basis. If at any point you wish to take a break from your caregiving duties, one of our fully vetted and trained caregivers can take your place, providing your loved one with the attentive care they deserve in your absence.